Joe Abercrombie is back with A LITTLE HATRED! Orbit is delighted to announce that we will be publishing a phenomenal new trilogy from the New York Times bestselling author Joe Abercrombie in the US, at the same time that it will be published in the UK by Gollancz. The first book in the trilogy, A LITTLE HATRED, publishes in September 2019. A Little Hatred marks Abercrombie’s much anticipated return to the world of the First Law. The novel features exciting new characters, along with the return of some memorable faces for longtime Abercrombie fans. Written and told in a way that only Abercrombie can, the new trilogy is a visceral story of bloody revolution. If you’re a fan of the First Law, then we can promise that you’re going to love it. If you’ve yet to read Abercrombie (and how could this be true? ), A Little Hatred is your time to rectify that mistake. 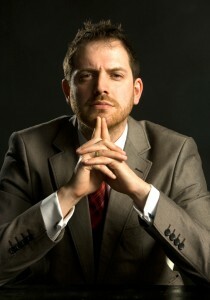 Joe Abercrombie is the author of the First Law Trilogy (The Blade Itself, Before They Are Hanged, and Last Argument of Kings). His standalone novels (Best Served Cold, The Heroes, and Red Country) are also set in the First Law world.